SRS components are located In this area. Review the SRS component locations: 4-door (see page 24-21), 2-door (see page 24-23) and the precautions and procedures (see page 24-25). NOTE: Do not damage or drop the combination switch as the steering angle sensor is sensitive to shock and vibration. 1. With the wheels in the straight ahead position and the steering wheel centered, remove the steering wheel (see page 17-6). 2. Remove the steering column covers (see page 20-181) and the cable reel (see page 24-225). 3. Remove the combination switch assembly (see step 7 on page 17-11). 4. 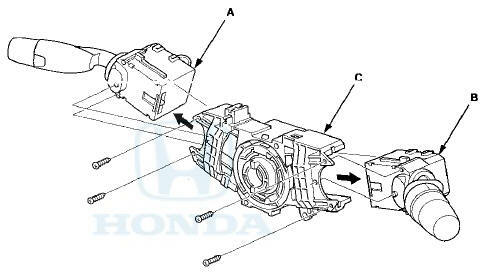 Remove the combination light switch (A) and the wiper/washer switch (B) from the combination switch body assembly (C). 5. Install the combination switch body assembly in the reverse order of removal. NOTE: - Do not remove the steering angle sensor from the combination switch body. - When installing the cable reel, set the turn signal canceling sleeve position so that the arrow points straight up (see page 24-226). - Note that the tightening order is specified for the combination switch mounting screws (see page 17-12).